If you’re an iPad-using, keyboard-playing musician, Akai has your dock. Their original SynthStation was a cute little accessory, but required playing a tiny keyboard (and iPhone-sized screen). The SynthStation49 looks more serious, with nine MPC-style pads, transport controls, and dedicated pitch and mod wheels. The iPad sits on what Akai describes as an adjustable “cradle,” so you can tilt it to whichever angle you want. That could mean tilting it up for reading notation or studio use, then down again for performance. Most importantly, the hardware supports Core MIDI, so application developers don’t have to specifically support this particular accessory. And the keyboard doubles as a USB MIDI controller, so you could use this as a normal keyboard and dedicate the screen to, say, a fake book app to read music. 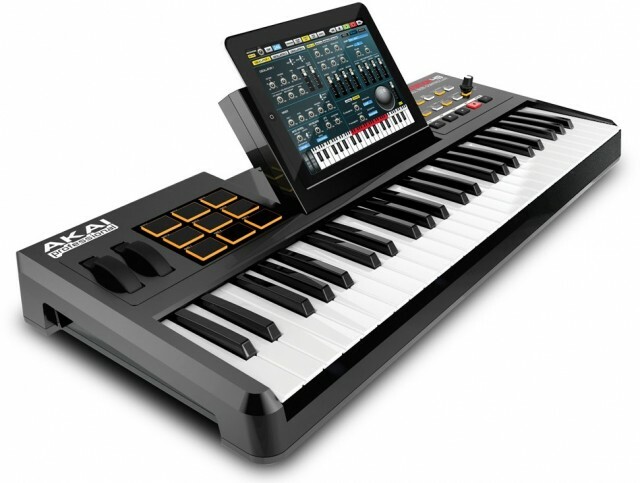 With USB MIDI support via the Camera Connection Kit, this is far from your only option even from Akai, and a dedicated keyboard and stand might be just as practical. But it’s tough to beat on ergonomics. There’s only one caveat, really, which is that Akai notes this is awaiting Apple approval. Thanks to Rawcoco for the tip.